Martin Payne, the title character of the classic sitcom that ran from 1992 to 1997, was an egotistical male chauvinist who worked at Detroit radio station WZUP. He had a group of friends whom he was never afraid to crack on — or kick out of his house. His antics were always ridiculous — especially when he brought out Mama Payne, Sheneneh, Jerome, Otis, Dragon Fly Jones, Roscoe, Bob from Marketing, Elroy Preston and King Beef. Lawrence's movie career took off during — and after — Martin's five-season run. There was the Bad Boys franchise, Big Momma's House, Blue Streak, Life and several others. (There are even talks of a third installment of Bad Boys.) He got back to producing with the short-lived TV series Love That Girl, featuring '90s star Tatyana Ali, in 2010. And if you watched the BET Awards in 2009, you may be wondering about — and anxiously awaiting — Sheneneh's big-screen debut. Gina loved her some Martin Payne. She stayed by his side after the worst marriage proposal ever, after his face swelled up and even after he joined a cult and had the half-braid-half-Afro thing going on. After her departure from Martin, Campbell-Martin starred in the ABC sitcom My Wife & Kids, opposite Damon Wayans, from 2001 to 2005. She also made appearances on All of Us, Everybody Hates Chris, Rita Rocks and The Protector. In Colored My Mind, a documentary on autism, she talks about how helping her son cope with autism has changed her life. Cole Brown had a full-time job, half a brain and lived with his mama. He had a steady job at the airport, drove a Pacer and was only somewhat reliable. He went out to get the crew pizzas in a snowstorm, but taped over the end of Martin's farewell tape with an episode of Good Times. Payne had a few recurring roles on The George Lopez Show, Rock Me, Baby, and most recently, on The Game as Reynaldo, Tasha's (Wendy Raquel Robinson) love interest. In 2011, TMZ found the actor — who is also well-known for his role as Cockroach on The Cosby Show — selling cars. "It's going wonderful. I got a family, man. And it's no shame in taking care of your family." Tommy Strawn, one of Martin's best friends since childhood, kept the biggest secret of '90s television history. We're still scratching our heads, trying to figure out what he did for a living. With his loud, memorable laugh and common-sense advice, he was the perfect straight man to Martin's crazy antics and Cole's not-quite-right sensibilities. Immediately after Martin, he had a recurring role as Lt. Malcolm Barker on another Fox hit, New York Undercover. From 2006 to 2008, he was the "Pope of Comedy" for Who's Got Jokes? He completed two films this year, Unspoken Words and Love and Success, according to IMDb. Gina's best friend Pam was Martin's archenemy. They cracked jokes on each other in nearly every episode: "Pam, your hair is so nappy Wilson couldn't pick it." He called her Scary J. Blige, Scrappy Doo and Nappy Longstocking. And she called him everything from Ren and Shrimpy to Arsenio Small to Inch-High Private Eye. And if he wasn't cracking jokes on her buckshots, he was talking about how her "breath smelled like boiled bologna." Remember the jewel-encrusted bandanna fad in the late '90s and early 2000s? Arnold started her own line called China Moon Rags. In the early 2000s, Arnold had a recurring role on the sitcom One on One, opposite Flex Alexander and Kyla Pratt. From 2005 to 2009, she starred as Rochelle in the TV show Everybody Hates Chris. Currently, she co-stars with Fran Drescher on TV Land's Happily Divorced. She also performs with her band, Know Pressure, and recently got married. Stan was always offering the worst love and life advice. Perhaps his words were supposed to match his terrible wardrobe. (He could compete with Craig Sager, for sure.) He was to blame for Martin's bus-station Christmas, and his tricky business practices landed Martin in the unemployment office. The Saturday Night Live veteran has a recurring role on CBS' 2 Broke Girls. When he left Martin, he co-starred on The Jamie Foxx Show as Uncle Junior, a penny-pinching hotel owner. Sean was Martin's audio engineer at WZUP, during the first few seasons of Martin. He was a bit quirky, offering to sing "White Christmas" at the projects, and he was the prankster behind the Halloween episode with "Old Man Ackerman." Gries has several roles set to premiere in the next couple years, according to iMDb, including a TV series called Dr. Fubalous and a few movies. His most memorable roles have been as Uncle Rico in Napoleon Dynamite and as a recurring character on Lost. Nipsey ran the local bar in Martin's neighborhood. Martin was Lampkin's first on-screen role, and he continued to work with Lawrence on other productions including Life, Big Momma's House 1 and 2 and Bad Boys II. Bruh Man was Martin's neighbor who lived on the "fif' flo'," was always "just chillin' " and walked with a slow bop. But he never could get with Martin's No. 1 rule: "Respect my house." He showed up unannounced, wore Martin's clothes and even stole his $400 CD player. Most recently, he appeared on episodes of Rizzoli & Isles and Weeds. In the early 2000s, Ballard played Bernie Mac's friend, W.B., on the late comedian's sitcom, always down for a game of poker in the basement. You can follow him on Twitter. It's almost hard to believe that Tracy Morgan was Hustle Man on Martin. It's even harder to pick your favorite Hustle Man scene because he had so many great lines. Could you pick your favorite between his "pick up the pieces" moment and his "pigeons on a branch" sales pitch? Since 2006, Morgan has co-starred as Tracy Jordan on NBC's 30 Rock. He briefly starred in his own show in the early 2000s, and he was on Saturday Night Live for several seasons. In 2011, he was under fire, first for using antigay language in his standup and then for talking about mentally and physically challenged people. Evans only had a few cameos on Martin, but true Martin fans will remember him as the guy who admired Martin's skin tone. "You so aaaalllmoooondyyy!" he cooed at the DMV when Martin tried to renew his license in the fourth season. During the last three seasons, Evans was a producer for Martin. Evans has been busy producing several TV shows over the past few years, including Bounce TV's Family Time, TV One's Love That Girl (also with Lawrence), The Orlando Jones Show and The Jamie Foxx Show. No senior citizen could go toe-to-toe with Martin Payne like Ms. Gerri. She "took his kindness for weakness" when he gave her his tuna sandwich. They scrapped on a bus-station floor for some quarters. And she was always threatening to knock him over the head with a bag of nickels. 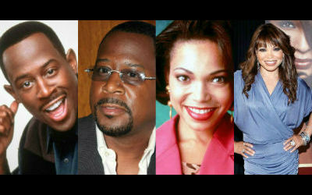 Gray appeared in several '90s sitcoms including Sister, Sister, Fresh Prince of Bel-Air, Sinbad and A Different World. She died in 1997 from a heart attack. She was 72. Since Martin, Khali's probably best known for her role as Nina Campbell in 3rd Rock From the Sun. This year, she also appeared in an episode of Showtime's Weeds. Random fact: She's married to another '90s TV star, Cress Williams, who played Khadijah's on-again-off-again boyfriend, Scooter, on Living Single. He was a barber at Mr. Jim's Barbershop, but it's hard to understand why he had a close fade with that one crimped track of hair weave around the back of his head. Although you may remember Tibbs as Lil' Dawg on Martin, he was actually the show's stage manager for a few episodes. He also worked on the production crew for The Jamie Foxx Show and Sister, Sister. Mr. Jim had been Martin's barber since he was a little kid. Wesley has had a steady acting career for nearly 50 years. Since Martin, he's appeared in The Wood, I Got the Hook Up and The Jamie Foxx Show. It's hard to say who was more dim-witted: Cole or his girlfriend-turned-fiancée Shanise. They couldn't have made a better, more clueless couple. Aside from a one-time appearance on In the House and a movie called Swirl, McDade hasn't appeared on-screen very much since her role as Shanise. Elder played Gina's mother, Mrs. Waters. She was there when Martin found out that he had a "Martin Jr." And she tried to hook them up with a bougie wedding planner to no avail. If you were still tuning in to Family Matters in its final season, Elder was the new Harriet Winslow in 1998, in the show's last few episodes. Martin didn't make the best first impression when he met Gina's dad, Dr. Cliff Waters. He showed up at their favorite upscale restaurant, Chez Maurice, as his loud radio personality self and spilled wine on Mrs. Waters. Later that night, he was caught with his pants down at Gina's house. Since Martin, Preston appeared on a few television series, including Chicago Hope, The Sentinel and Touched By an Angel. His most recent role was in 2006 in Sweet Deadly Dreams. Ramos played the Paynes' trifling landlord. Remember the episode in which he demanded the rent increase and was found in Mrs. Jackson's apartment "fixing her pipes"? For close watchers of the show, you'll also remember that he was on an early episode when Gina went out of town for work, and Martin emerged from under the bed. Ramos, who appeared in Do the Right Thing with Martin Lawrence in 1989, has most recently made appearances in the TV shows Common Law, How to Make It in America and Burn Notice. Hayes played Cole's gossiping mother. She was friends with Mama Payne and loved to play bingo and eat chicken tenders. In 2001, Hayes starred in The Queens of Comedy with Sommore, Mo'Nique and Adele Givens. Drake played Stan's main squeeze, Myra. Exactly how she tolerated Stan's ways is beyond our imagination, especially when he took her on a double date in a hearse. Myra also worked at the unemployment office and helped Martin get a job as a mailman and a drive-through window cashier at Hoochie Burger. This year, Drake appeared in the movie What Goes Around Comes Around with Reagan Gomez-Preston and Wesley Jonathan. And she's maintained a pretty steady career since her days on Martin, with roles in The Bernie Mac Show, Friday After Next and How to Be a Player, among other roles. Whitaker, aka rapper Yo-Yo, played Sheneneh's homegirl Keylolo. They drank 40s together — and even performed in the local talent show. In 2010, Yo-Yo appeared in the BET documentary My Mic Sounds Nice, which featured women in hip-hop. Two years prior, she performed with MC Lyte, Salt-n-Pepa and Lady of Rage on the BET Hip-Hop Awards.